A wheel that can transform into a triangular track, developed by Carnegie Mellon University's National Robotics Engineering Center with funding from the Defense Advanced Research Projects Agency, is a winner of a Popular Science "Best of What's New" Award for 2018. The reconfigurable wheel-track can transform from one mode to the other in less than two seconds while the vehicle is in motion, enabling a vehicle in wheel mode to operate at high speeds on roads and switch rapidly to track mode to negotiate challenging off-road terrain. The device was recognized by Popular Science with a Best of What's New Award in the Security category. The magazine presents the awards annually to 100 new products and technologies in 10 categories, including aerospace, entertainment, and health. "The Best of What's New Awards allow us the chance to examine and honor the best innovations of the year," said Joe Brown, editor in chief of Popular Science. "This collection shapes our future, helps us be more efficient, keeps us healthy and safe, and lets us have some fun along the way." 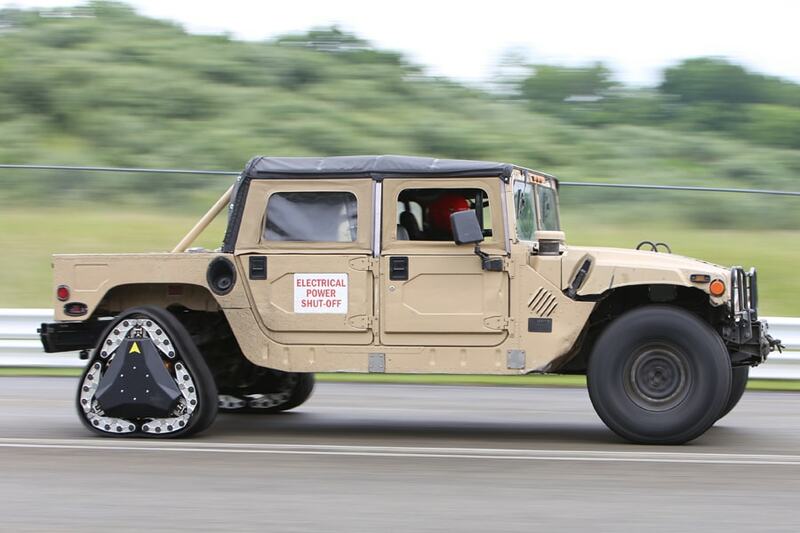 The innovative wheel-track was one of the technologies developed in DARPA's Ground X-Vehicle Technologies (GXV-T) program, which aimed to reduce the need for armor by making combat vehicles faster, more maneuverable and capable of operating in a wide variety of environments. The National Robotics Engineering Center at Carnegie Mellon demonstrates its reconfigurable wheel-track technology. Dimi Apostolopoulos, a CMU Robotics Institute senior systems scientist and principal investigator for the wheel-track project, said the shape-shifting wheel-track has a number of potential civilian applications as well, including uses in agriculture, mining, construction, forestry and transportation, and to vehicle sizes ranging from heavy equipment to recreational vehicles. "Creating a reconfigurable wheel-track system that works on a moving vehicle and at high speeds was an exceptional challenge, but our NREC team came up with a design that works and has the potential to transform ground mobility," Apostolopoulos said. "We are appreciative of DARPA's GXV-T program and we thank the editors of Popular Science for this recognition." The wheel-track has a rubberized tread that sits atop a frame that can change shape. The spinning wheel is transformed into a track by extending a Y-shaped support, which pushes the frame into a triangular shape. Simultaneously, application of a brake to stop the wheel from spinning causes the transmission to automatically shift from turning the wheel to turning a set of gears that drives the track. Though other research groups have built devices similar to NREC's reconfigurable wheel-track, those previous designs have required halting the vehicle to transform from one mode to the other, Apostolopoulos noted. The ability to make these transformations on the fly, he added, is a critical requirement for vehicles that must handle changing terrain at high speed. In testing to date, vehicles have been able to achieve 50 miles an hour in wheel mode and almost 30 mph in track mode. The device has been able to transform from wheel mode to track mode at speeds as high as 25 mph and from track mode to wheel mode at speeds of around 12 mph. Previous winners of Best of What's New Awards from Carnegie Mellon include Tartan Racing's Boss self-driving SUV, a self-landing helicopter, a snake-like robotic neck surgery tool, an automated method for editing video, a panoramic video camera and a photo editing tool that can manipulate objects in a photo as if they were three-dimensional. NREC is a part of Carnegie Mellon's Robotics Institute that performs contract research and development for a variety of governmental and industrial clients.